Lisl von Schweinitz lives and ministers in northern England where she has lived for the past couple of decades. She was a close friend of ours who came to the Lord during the Jesus People movement here in Tucson in the early 70s. She has lived and ministered through World Vision in Germany and Austria before moving to Nelson, England where she presently resides. She knows that her life and sustenance comes only from the very life of God that came to her through Jesus Christ. She has committed her life to sharing that good news that God is in Christ offering new life to all who will receive him as Savior and Lord. She now has completed her studies for her degree in Charismatic and Pentecostal studies. Now since the heart problems have gotten worse she is retired and enjoying living with her canine friends. On occasions she still shares the Lord when invited but she has slowed down a great deal these days. Her local Church has her share the word because she is an excellent teacher of the scriptures. 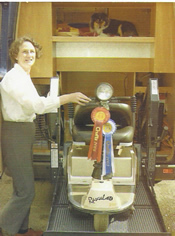 The smaller picture here is of Lisl inside the Van with the trolley. The Van is designed to handle her scooter for getting around as well as a place to sleep and to cook her own meals when traveling. She still owes some on the Van and makes payments but her provision is always there. Also pray for the Lord’s protection as she faces quite a bit of harassment from neighbors at times simply because of her strong Christian stance. When we are bold and stand for the Lord we do receive opposition but the Lord will always raise a standard against Satan when he attacks. That standard of protection is bulwarked by the prayers of the saints that love her. So, always remember her in your daily prayers. 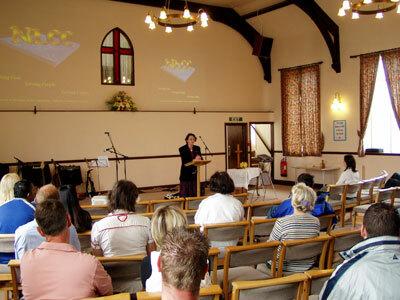 The picture shows Lisl sharing at her local Church there in northern England. Jim Brunner Ministries still handles the occasional stateside support she receives. Any donations for her through us will receive a tax deduction receipt. Lisl can be contacted directly by mail at her home address, 23 Hammond St. Nelson, Lancashire, England BB9OLJ. God bless you for your prayers and faithful support for Lisl and her ministry in that area.